Another Sunday, another instance of Superman teaming up with an anthropomorphic bunny... Sorry, no delicious chocolate milk this time... might I interest you in a carrot? We open on Superman and Captain Carrot discussing their current plight. Evidently, in the Captain Carrot Special Preview in (New) Teen Titans #16 Superman was zapped into Earth-C (for "carrot", maybe? "cartoon", perhaps? ), an Earth full of "funny animal" characters. While flying, the two observe a plane being bombarded with rays from the planet Pluto (it's still a planet to me). The ray causes the animals inside to "revert", lose their more human traits... such as the ability to fly an airplane. The plane begins is speedy descent and plummets toward the ground. Superman is able to swoop beneath the airliner to ensure it lands belly first on the tarmac. Once on the ground, the plane continues to taxi at speeds well over 100 mph. It is up to Captain Carrot to halt the jet before it crashes into the airport. With the day saved, Superman and the Captain head out to toward Pluto to see what's what. Along the way, Captain Carrot recounts his origin. One day, in his civilian life, comic book artist (of the JLA: Just'a Lotta Animals, natch) Roger Rabbit (!) the Captain ate an irradiated carrot. A meteor had recently landed, and gave several of the "funny animals" super powers. The duo are unable to make it all the way to Pluto due to a (Yogi) barrier. Superman finds himself trapped like "a fly on flypaper" before vanishing. Captain Carrot begins to plummet back to Earth. Luckily, he happened to be exploring space directly above Piggsburgh, home of the mighty "Pig-Iron". The over-sized super swine handily catches the Captain and the two decide to team up. Pig-Iron shares his origin as well. He was once Peter Porkchop (there's a morbid name for a pig), a steel mill worker, who was bopped on the head with a chunk of meteor causing him to take a swim in a limestone vat. The two realize that in order to help Superman they are going to need more help. In the Special Preview edition, the news showed four additional post-meteor superheroes. It is decided to recruit them to the cause. First stop, Mew Orleans to draft Alley-Kat-Abra. It's Mardi Gras, and the streets of Mew Orleans are hopping... Before the boys can approach Alley, a Pluto-revert ray bathes the crowd. Carrot, Pig-Iron, and Alley team-up to restrain the crowd of newly "wild" animals before regaining order. Alley-Kat-Abra agrees to join the cause, however, not before subjecting them to her senses-shattering origin tale. Felina Furr, martial arts instructor and soup enthusiast accidentally ate some meteor-irradiated tabbachi, giving her magic powers. Next stop, the great state of Kornsas to draft Fastback, the reptilian rocket! We are introduced to Fastback as he attempts to stop a "cotton-pickin' tarnado" that, as luck would have it, just happened to ensnare our proto-Zoo Crew. After stopping the tornado, we have another origin story foisted upon us. World's slowest firefighter, Timmy the Terrapin was heading west when a chunk of meteor landed inside his shell causing him to "run like sixty". Our final stop, Follywood... home of Rubberduck and Yankee Poodle. The gang arrives during rush hour, and the heroes they seek are currently making an attempt to direct traffic. After lending them a hand, Carrot is able to convince the duck and dog to join up. Yet another origin tale follows... Here we witness gossip columnist Rova Barkitt and screen actor Byrd Rentals (hey, I get that reference) being victimized by their chunk'o meteor. While they were relaxing in their Bel-Airdale mansion, Rova takes a meteor to the head, which bounces into Byrd's Jacuzzi. Rova was given the "American" powers of attracting with one hand, while repelling with another, while Byrd got the Mr. Fantastic/Elongated Man treatment. Captain Carrot lays out their task, and our six-some head Pluto-way. Upon arrival at the Yogi-Barrier, the new-crew is zapped away, just as Superman was earlier. They are now on Pluto where they find not only the captive Man of Steel... but his captor... Starro the Conquerer! Not to be left out, Starro shares his origin with the crew, recounting his battle with the Justice League of America in The Brave and the Bold #28, and his defeat at the hands of Aquaman. One of Starro's bits fell through a chartreuse hole leading to Earth-C where it grew into a brand-new Starro. Superman warns the Carrotteers that this Starro is a true threat. Our funny animal friends take turns attacking the giant starfish. Starro disposes of each member handily. It is then that the gang realizes they need to embrace the power of teamwork to take down their foe. Working in tandem the team easily overpowers Starro, before Alley-Kat-Abra covers the beast in magical salt... causing him to shrivel up like a slug. Superman congratulates the team on their victory and Captain Carrot dubs his collective as the Amazing Zoo-Crew. Our scene shifts to the White House, where President Mallard Fillmore is being spied on by a shadowy figure... and we're out. In lieu of a letters page, Roy Thomas provides a text piece, Candygram which proves to be an interesting history lesson in "Funny-Animal" comics. Yeah, I guess I'm not a "funny animal" kinda guy. I get that this is attempting to be funny... but, as a guy who often (unsuccessfully) attempts to be funny, I think I've kinda got a feel for when something falls flat. This issue played with well-trodden comic book tropes, and I suppose it did so the best way it possibly could... it just went to the well a few times too many. I also didn't dig that this was the first issue of this series, and not the beginning of the story. I suppose I could dig through my old Teen Titans books to check out the preview piece and see Superman get zapped onto Earth-C... but, I don't feel I should have to. The non-origin writing was decent, though certainly not up to the level of quality I would normally expect from Roy Thomas. I understand this is a different kind of animal (pardon the pun), so I suppose that may be somewhat unfair criticism. The art, for the most part is great. There were several instances throughout this issue, however, where panels were packed so densely that it was hard to follow the action... or even look at, if I'm being honest. This is especially evident toward the end of the book. Perhaps my biggest takeaway from this issue is how bigoted Captain Carrot is. No less than four times throughout this issue, he refers to Superman as "Pinkie". Words hurt, rabbit... I might expect that from Fastback... but, you? C'Mon. Can't really recommend this one outside of its novelty, though if you are inclined... DC Digital has this issue at #1.99... which feels rather steep. There is also a giant Showcase Presents black and white volume available, which if you don't mind the lack of color, will give you much more content for your money. "No Deposit, No Return" is much more common a book title than you would think. Embrace your second amendment rights. These are safe AND legal, y'all. Who wouldn't want a Panasonic Reggie Vision??? Labels: 1982, captain carrot and his amazing zoo crew, roy thomas, scott shaw! 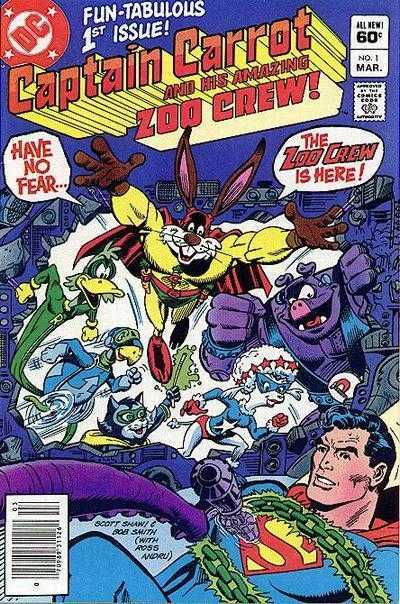 I loved Captain Carrot and his Amazing Zoo Crew as a kid, but in my defense I was seven years old when this issue came out! Hello Reggie! Thanks for stopping by! I'm sure had I encountered the Cap'n as I child I would've dug it myself. I'm guessing Roy Thomas wasn't writing this with a fool in his mid-thirties in mind, heh.